Remodeling a bathroom or bathrooms can be an enormous undertaking. The cost of remodeling a bathroom can also soar through the roof. That’s why the bathroom remodel checklist from Microsoft is such an invaluable tool. With the bathroom remodel checklist, you can keep track of all the items you’ll need to create the perfect bathroom for your home. The easy-to-read Microsoft bathroom remodel checklist is also incredibly easy to use. You can download the bathroom remodel checklist from Microsoft for free by clicking the link found on this page. The bathroom remodel checklist comes in the form of a Microsoft Excel template. The checklist is customizable and can be altered in any way that would best suit your remodeling needs. The area category is reserved for the area of the bathroom you plan to remodel, such as the bath, cabinets or faucets. The items category is reserved for the item or items you need to purchase. Next, add the quantity of the item you need to purchase to the bathroom remodel checklist. Perhaps the best thing about the bathroom remodel checklist is the fact that it also serves as a calculator. Once the estimated cost and the actual cost has been added to the itemized cost or total cost section, the difference will be calculated automatically. If you go over you estimated amounts, the total will be displayed in red. If you are under your estimated amount, the difference will appear in black. The total financial numbers will appear at the bottom of the bathroom remodel checklist. 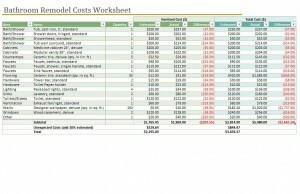 The bottom of the template will include the subtotal, unexpected costs and overall total. Download the Microsoft bathroom remodel checklist template for free today!